What does it really mean to love someone? 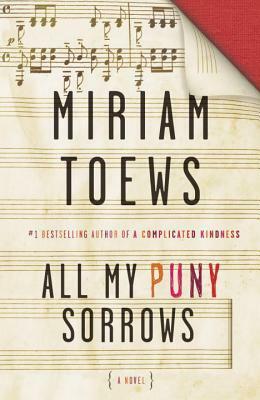 That is the question behind Miriam Toews’ new book, All My Puny Sorrows. In an interview with CBC Radio’s Jian Ghomeshi, Toews talks about how using her own life as raw material helps her to create “order out of the chaos”. In sharing it with others, she hopes to be able to shed some hope and light on the darkness. She feels she has a responsibility to appreciate her ability to feel joy, and to write about these difficult things, because her sister and her father were not able to. The central theme of All My Puny Sorrows is Life versus Death. Yolandi and Elfrieda are sisters who love each other, but are at war. Elf wants nothing more than to die, and Yoli desperately wants her to live. Elf took my hand, weakly, like an old dying person, and looked deeply into my eyes. Yoli, she said, I hate you. I bent to kiss her and whispered that I knew that, I was aware of it. I hate you too, I said. So, Yoli has to ask herself what love really means. Does it mean sitting by her sister’s side witnessing her pain, and willing her to want to live? Or, does it mean helping her to end her suffering? As Yoli goes through her days, she grapples with this question. What should she do? Did Elf have a terminal illness? Was she cursed genetically from day one to want to die? Was every seemingly happy moment from her past, every smile, every song, every heartfelt hug and laugh and exuberant fist-pump and triumph, just a temporary detour from her innate longing for release and oblivion? All right, so the brain is an organ that’s made to solve problems so if the problem is life and its unlivability then a rational, working brain would choose to end it. No? I didn’t know what to do. It felt like someone was throwing darts at the side of my head, five seconds apart. It sounded naïve to me now and selfish and fearful to say you must live, you must want to live, you have to live. That’s your one imperative, the single rule of the universe. All My Puny Sorrows is beautifully written and draws you in to Yolandi’s life and thoughts. She is scared, brave, angry, joyful, confused, and alive. At no time will you want to put her down (unless to get a tissue). Most of us, I’m sure, have been affected in some way by depression or mental illness. If nothing else, this novel lets us know we are not alone. It reminds us that mental illness and it’s effects are real and painful; it can sometimes be cured, but sometimes cannot. To be left behind by a loved can make us feel hurt and angry, and we tend to think of it as selfish. But, perhaps, it is selfish of us to want to keep them here where they suffer day after day. All My Puny Sorrows gives us a lot to think about. I highly recommend it. Here are a few more passages from the book that I liked. This one highlights the impartiality of the disease. It doesn’t matter what we think should make us happy or unhappy; we just are or we aren’t. Listen! I want to shout at her. If anyone’s gonna kill themselves it should be me. I’m a terrible mother for leaving my kids’ father and other father. I’m a terrible wife for sleeping with another man. Men. I’m floundering in a drowning non-career. Look at this beautiful home that you have and this loving man loving you in it! Every major city in the world happily throws thousands of dollars at you to play the piano and every man who ever meets you falls hard in love with you and becomes obsessed with you for life. Maybe it’s because you’ve perfected life that you are now ready to leave it behind. What else is there left to do? At one point, Yolandi was feeling frustrated with Elf’s seemingly uncaring psychiatrist. Imagine a psychiatrist sitting down with a broken human being saying, I am here for you, I am committed to your care, I want to make you feel better, I want to return your joy to you, I don’t know how I will do it but I will find out and then I will apply one hundred percent of my abilities, my training, my compassion and my curiosity to your health- to your well-being, to your joy. I am here for you and I will work very hard to help you. I promise. If I fail it will be my failure, not yours. I am the professional. I am the expert. You are experiencing great pain now and it is my job and my mission to cure you from your pain. I am absolutely committed to your care. Nora and I are conducting a bit of an experiment. We’re attempting to make eye contact with Torontonians. It’s frustrating. People are startled when we look at them and quickly look away or somehow will themselves not to even look in the first place. We’ve noticed that some people visibly will turn their heads away from us and even their shoulders so they’re not tempted to look. Today Nora and I went for a quick walk in the neighbourhood and of the sixty-eight people we passed on the sidewalk only seven of them returned our gaze and of those seven only one smiled and it might not have been a real smile but a grimace due to gas. Will carried Zoe on his back and zoomed up and down and lost one of her flip-flops so we had to go back and retrace our steps in the dark which I suppose is the meaning of life. I am left wondering why this is only the second book I have read by Miriam Toews. A few years ago I read A Complicated Kindness and loved that one, as well. Which one will I read next? I do like Miriam Toews. The first one I heard of was Swing Low, about her dad. It’s very sensitive. I think this one would be very sad, but I would be interested in reading it as it is a non-fiction account. Her only one, so far, I think? Gotta get to this one. I’ve only read A Complicated Kindness too, which I like but didn’t love – sounds like I could love this! It reminds me of After Alice, which I reviewed a few months back. Sister stories are awesome. This is a good sister story, and if you don’t mind sad (which I don’t), then you should like this one! This was actually the first book I’ve read by Miriam Toews and I’m absolutely sold on her as a writer now. I loved the first quote that you picked out – that was one of the first ones that jumped out at me as well. It’s such a delicate book with important messages to share. I’m so glad you enjoyed it! I bought a copy of A Complicated Kindness the other day so I’m looking forward to reading that. I have two of her other books, both of which I’ll hopefully get to soon. I hope you enjoy A Complicated kindness! Sounds like a wonderful book. Just the one I’m looking for next. Thanks!! I hope you like it as much as I did! Thanks for commenting! Thanks for the suggestions! I own her more recent books, so I will probably end up reading those ones first, but it’s good to hear that you liked these ones, as well. I love her titles! After listening to the interview with Jian Ghomeshi, I realized just how personal this book was. It’s a good interview. I listened to it as well – it is a great interview. I know “they” say that Jian has a bit of an ego in person, but damn, I love his interviews. Me too! I don’t care what they say! I’ve only read ‘The Flying Troutmans’ which also touches on difficult relationships with sisters. I’d recommend it, though I suspect it has a little less depth than this book. Thanks for the suggestion! I think I even have that one (somewhere under my bed). I’m reading Irma Voth right now, and so far it seems to also be about sisters. The sister theme is obviously important to her. This sounds like a compelling read…I will definitely look this author up. It also reminds me of the French movie that came out a couple of years ago, Amour. Have you seen it? It deals with similar themes in long-term marriage. I haven’t seen Amour, but now I am curious… Thanks for telling me about it! I have heard so much about this book, but a little confused about the tone. Is it very sad or a bit humourous or both? I understand from what I read that the author based it on her sister. Yes, it’s based on her sister, and it is sad, but Miriam Toews writes with a lot of humour, which makes the sadness bearable to read. In the interview she talks about how she thinks having a good sense of humour is so important to help us work through trauma. It really isn’t too sad to read, although it sounds like it would be. It’s actually really thought-provoking. Definitely worth reading! Thanks for clarifying! I normally shy away from sad stories, but I recently read The Fault In Our Stars and that was supposed to be sad. With books, you never know until you try, right? Right! There are so many different kinds of sad. Irma Voth! You won’t be disappointed. Thanks, Kerry! That’s the one I read, actually. And, when I was perusing your blog yesterday, I saw that you had reviewed it. I did like it! Have you read any of her others? A Complicated Kindness, which I also liked very much, although her writing has developed significantly since then.